At the end of the 18th century in France, a revolutionary storm is raging in Paris. The monarchy was abolished after the populace seized the Bastille prison in 1789. While the Jacobins led by Robespierre are arresting and sentencing nobles to death, the angry populace are demanding more nobles be sent to the guillotine. Percy Blakeney, an English aristocrat, dislikes the reign of terror by the French revolutionary government. He is saving innocent nobles from the daily executions and helping them to flee France. Although his daring rescue attempts are much talked about, he has been successful in keeping his identity concealed. Chauvelin, a member of the Committee of Public Safety of the French revolutionary government, is out to discover the identity of the Scarlet Pimpernel, which means a red star-shaped flower in England. Marguerite Saint-Just, star of Comédie Française, makes her final stage appearance before an audience-filled theater. She will quit the stage this evening and go to England to get married to her fiancé Percy. She radiantly greets the audience. All of a sudden Chauvelin stands up out in the audience and orders the performance to be stopped and the theater to be closed on the charge that Marguerite had criticized the revolutionary government. Marguerite and Chauvelin at one time were comrades fighting together for the revolution. However, these days she has been voicing opposition against the Republicans' atrocious acts. Chauvelin, who is excited by the discovery of the identity of the Scarlet Pimpernel, threatenly offers to trade the license to reopen the theater for her information on the hide-out of the Marquis Saint-Cyr who opposes the Republicans. Although she initially refuses the offer, she ends up telling Chauvelin of Saint-Cyr's hide-out on the promise that he will never do the marquis any harm. Chauvelin is not at all a man of his word, sending the marquis to the guillotine. A few days later, in England, Percy and Marguerite celebrate their wedding blessed by many friends. During their wedding, Percy stands in shock after learning from his friend Dewhurst that the Marquis Saint-Cyr, Percy's trustworthy partner in France, had been executed. Dewhurst tells him that Marguerite betrayed the marquis to the revolutionary government, consequently leading to the marquis' execution. Percy learns that Dewhurst was right. Despite the fact that he finds himself in a dilemma between his love for Marguerite and his doubts about her, he encourages himself to overcome this first trial of his married life. The next morning he decides to tell some reliable friends that he is the Scarlet Pimpernel and convince them to join in his fight against the atrocities the French revolutionary government is committing. Their ultimate goal is to rescue the French king's orphaned son Louis Charles de France. Shortly afterward Marguerite's younger brother Armand joins them. They all cross the Strait of Dover in high spirits. The actions undertaken by Percy and his friends anger the revolutionary government. Percy, disguised as Belgian spy Grapin, becomes acquainted with Robespierre and Chauvelin and is successful in locating Prince Louis' whereabouts. Chauvelin goes to England as Ambassador extraordinaire and plenipotentiary of France with orders to arrest the Scarlet Pimpernel, who is said to be an aristocrat. On arriving in England, Chauvelin orders Marguerite to collect information about the Scarlet Pimpernel by sounding out the friends of Percy, a social star. Scornful of Chauvelin's bold manner, she gives him a flat refusal. Percy learns that Chauvelin will attend a ball to be held by the Prince of Wales. He proposes to his friends that they go to the ball dressed in a most eccentric fashion in order to throw off any suspicions about the identity of the Scarlet Pimpernel. In Paris, Armand, who had been preparing a plan to rescue Prince Louis, is arrested by a member of the Committee for Public Safety on charges of being part of the Scarlet Pimpernel's plot. Marguerite is wondering why her husband Percy has suddenly turned cold towards her after the wedding ceremony. She supposes that Percy does not love her anymore and is about to make a painful decision to break off with him. Meanwhile, Percy is observing her in order to find out her real intentions. At the ball, Percy and his friends dressed in unusual clothes behave in such manner as no one can suspect their identities. Chauvelin arrives as a guest. He comes to Marguerite and tells her that Armand was arrested. This time he offers to trade Armand's life for her cooperation with him. Utterly distracted at the news of Armand's arrest, she accepts Chauvelin's offer and gets certain information about the Scarlet Pimpernel. Percy and Marguerite each try to find out the truth, while Chauvelin wants to discover the identity of the Scarlet Pimpernel. All three of them return to Paris with the aim of realizing their respective purposes. The Scarlet Pimpernel premiered on Broadway in 1997, and has been performed around the world. For more information about the musical, visit the Official Scarlet Pimpernel Website. 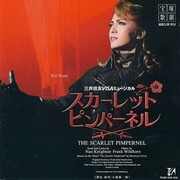 The songs "A Piece of Courage" and "Days of Glory" were written by Wildhorn and are unique to the Takarazuka version of the musical. 6/29/08 - Kotoshiro Manaka will be absent from for the remainder of the Takarazuka run due to poor health. She will also be absent for the Takarazuka shinjin kouen. The show won an Excellence Award at the 16th annual Yomiuri Theater Awards. Yuzuki Reon won a "New Actor" award at the 30th Matsuo Entertainment Awards. The show won the "Grand Prize" award at the 34th Kikuta Kazuo Drama Awards, announced in early April 2009 and presented on 21 April. Created by mizukusa. Last Modification: Wednesday 11 of June, 2014 14:22:33 PDT by kyanited.